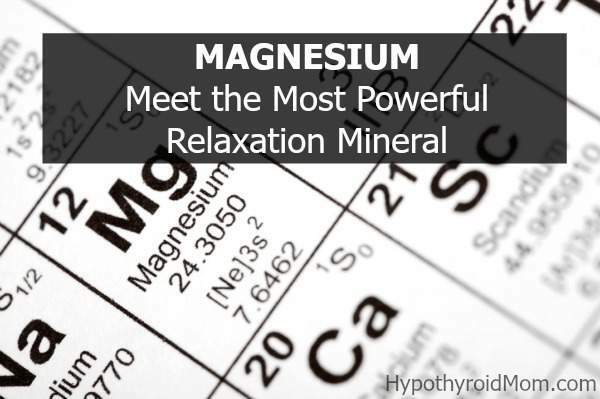 Discovering that I was severely deficient in magnesium turned out to be life-changing for me. For years I struggled with chronic constipation, nervousness, anxiety, headaches, persistent eyelid twitches, blurry vision at times, recurring bladder infections, kidney stones, frequent urination, sensitivity to bright lights and loud noises, tension in the upper back, shoulders, and neck, physical and mental fatigue, PMS, menstrual cramps, and the peculiar feeling that I couldn’t take a deep breath accompanied with frequent sighing. Then came the first time I was shaving my legs in the shower and I couldn’t feel my legs. The numbness and tingling scared me and I rushed to the doctor who had no answer for my questions. It was thanks to a great new doctor who tested my RBC (red blood cell) magnesium that I discovered my serious magnesium deficiency and all the symptoms made sense. Supplementing with the magnesium glycinate mentioned in this article every night before bed has completely eliminated these symptoms and has helped me have better sleep on top of it all. “Magnesium deficiency commonly occurs in critical illness and correlates with a higher mortality and worse clinical outcome in the intensive care unit (ICU)”, according to a study published in The Journal of Intensive Care Medicine. It also accounts for a long list of symptoms and diseases — which are easily helped and often cured by adding this nutrient. In fact, in my practice, this nutrient is one of my secret weapons against illness. Yet up to half of Americans are deficient in this nutrient and don’t know it. I remember using magnesium when I worked in the emergency room. It was a critical “medication” on the crash cart. If someone was dying of a life-threatening arrhythmia (or irregular heart beat), we used intravenous magnesium. If someone was constipated or needed to prepare for colonoscopy, we gave them milk of magnesia or a green bottle of liquid magnesium citrate , which emptied their bowels. If pregnant women came in with pre-term labor, or high blood pressure of pregnancy (pre-eclampsia) or seizures, we gave them continuous high doses of intravenous magnesium. Magnesium deficiency has even has been linked to inflammation in the body and higher CRP levels, considered the best new test to predict heart disease. A recent scientific review of magnesium concluded, “It is highly regrettable that the deficiency of such an inexpensive, low-toxicity nutrient results in diseases that cause incalculable suffering and expense throughout the world.”  I couldn’t’ have said it better myself. Speak to your doctor about supplementation. Start with having your RBC magnesium tested. The most absorbable forms are magnesium citrate, glycinate, taurate, or aspartate, although magnesium bound to Kreb cycle chelates (malate, succinate, fumarate) are also good. People with kidney disease or heart disease should take magnesium only under a doctor’s supervision. Dr. Mark Hyman is the Medical Director at Cleveland Clinic’s Center for Functional Medicine, the Founder of The UltraWellness Center, regular contributor to the Today show, Good Morning America, and The Dr. Oz Show, and a ten-time #1 New York Times Bestselling author. As one of the most influential people in health and fitness, Dr. Mark Hyman is helping people all over the world lose stubborn weight with his books including Eat Fat, Get Thin: Why the Fat We Eat Is the Key to Sustained Weight Loss and Vibrant Health. 1. Tong, GM and RK Rude. 2005. Magnesium deficiency in critical illness. J Intensive Care Med 20 (1):3-17. Review. 2. S. Johnson. 2001. The multifaceted and widespread pathology of magnesium deficiency. Med Hypotheses 56(2): 163-70.